Head of Content @ Ahrefs (or, in plain English, I’m the guy responsible for ensuring that every blog post we publish is EPIC). Founder @ The SEO Project. 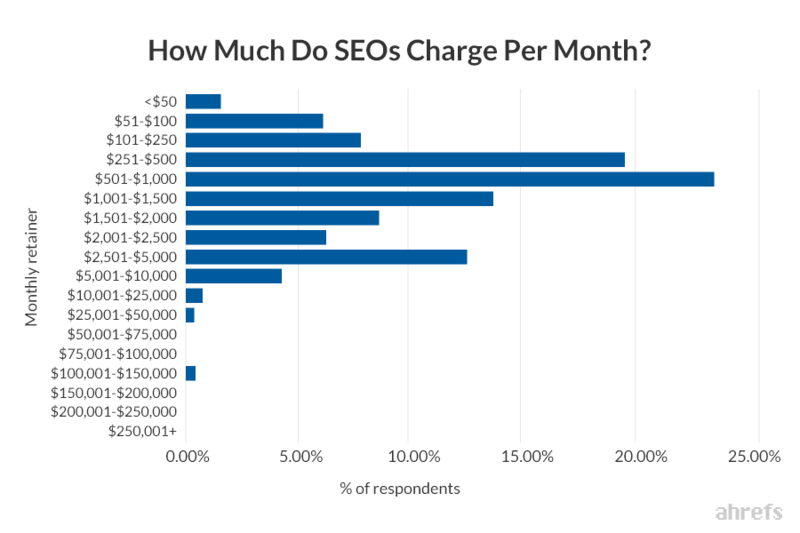 In May 2018, we surveyed the SEO industry to find out how much they charge for SEO services, and what pricing models they use. Here’s everything we learned from the 357 respondents. … Matt Cutts has left Google and is now in the SEO game. He offers his services worldwide and charges just $500-$1,000 per month. A bargain really, as I’ve heard he knows his stuff. I started with this example to illustrate that we didn’t just throw a survey into the air and blindly pull results in Google Sheets. We manually reviewed every submission to remove duplicates and spam, such as this Matt Cutts troll entry. We disallowed anonymous submissions to keep the original dataset as “clean” as possible. All respondents had to give a company website or freelancing profile. We didn’t restrict the survey to our audience. We promoted it heavily on Facebook to reach a broader range of SEOs. 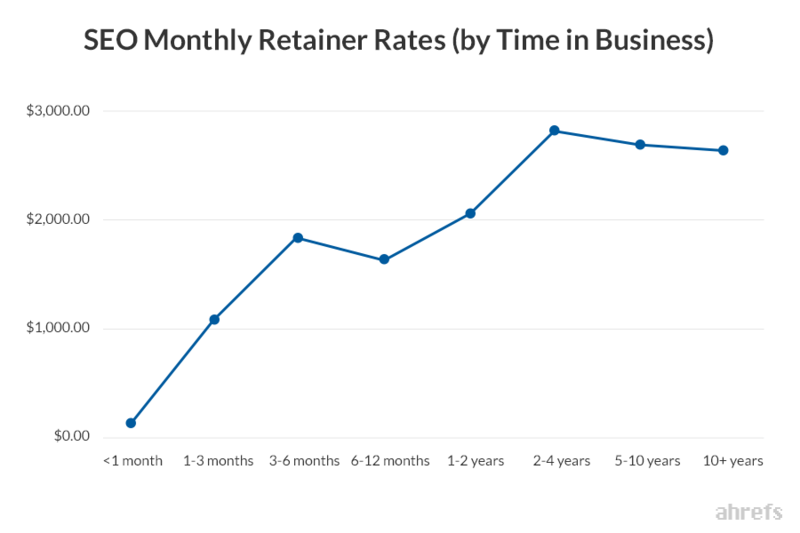 Most SEOs charge a monthly retainer for some or all of their services. 74.71% of respondents charge clients a monthly retainer fee. 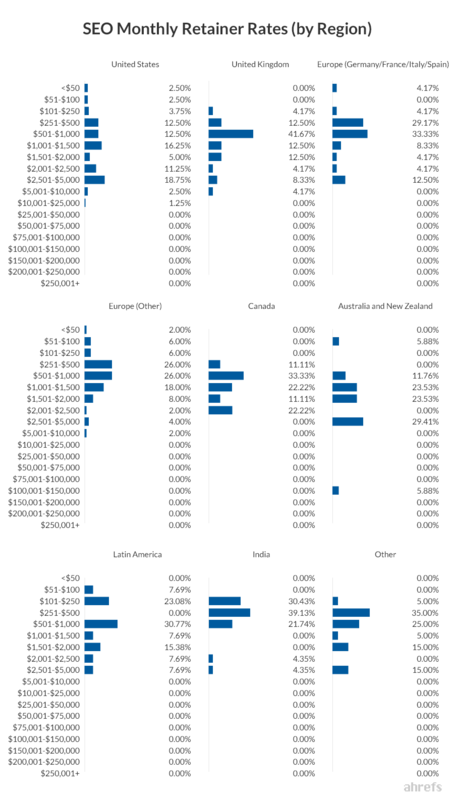 Pricing for this varies significantly from country-to-country, but it almost never exceeds $5K/month (94.23% of all respondents priced their retainers at $5K/month or below). Many SEOs offer numerous pricing models, although the majority don’t. 40.8% stated that they offer multiple pricing models. But 59.2% of respondents offer only one pricing model, 66.99% of whom charge a monthly retainer. This means that 39.66% of all SEOs surveyed only charge a monthly retainer—they do not offer hourly or per-project pricing to any of their clients. For monthly retainers, $501-$1,000 per month is the most popular pricing tier. 23.08% of monthly retainers fall within this range. The second most popular pricing tier is $251-$500, which accounts for 19.23% of all retainers. However, 24.23% of monthly retainers are $2,001/month or more. In the US, $2,501-$5,000/month was the most popular pricing tier. For hourly pricing, $100-$150 per hour is the most popular pricing tier. 25% of all hourly rates fall within this range. In the US, that figure jumps to 35.29%. The second most popular hourly pricing tier is $75-$100, which accounts for 19.53% of all hourly rates. For per-project pricing, $501-$1,000 is the most popular pricing tier. 25.17% of all projects fall within this range. However, 52.32% of respondents charge one-off fees of $1,001 or more, with some charging as much as $25,001-$50,000. Hourly rates almost never exceed $150/hour. 88.28% of respondents charge $150/hour or less, although over half (50.44%) of those people charge between $75 and $150 per hour. Only 11.72% of hourly rates exceed $150/hour, and only 6.25% exceed $200/hour. SEO agencies charge more than freelancers and consultants. Freelancers charge $68/hour, on average, whereas SEO agencies charge almost double that ($134.66). It’s a similar story for monthly retainers and per-project fees; SEO agencies charge 2–4x more than freelancers and significantly more than consultants. More experienced SEOs charge significantly more than less experienced SEOs (surprising, right!?). Those who’ve been in business for 2+ years charge 39.4% more per hour, 102.41% more for monthly retainers, and a staggering 275% more for one-off projects than those who’ve been in business for fewer than 2 years, on average. SEOs who only serve their local market charge significantly less than those serving the worldwide market. 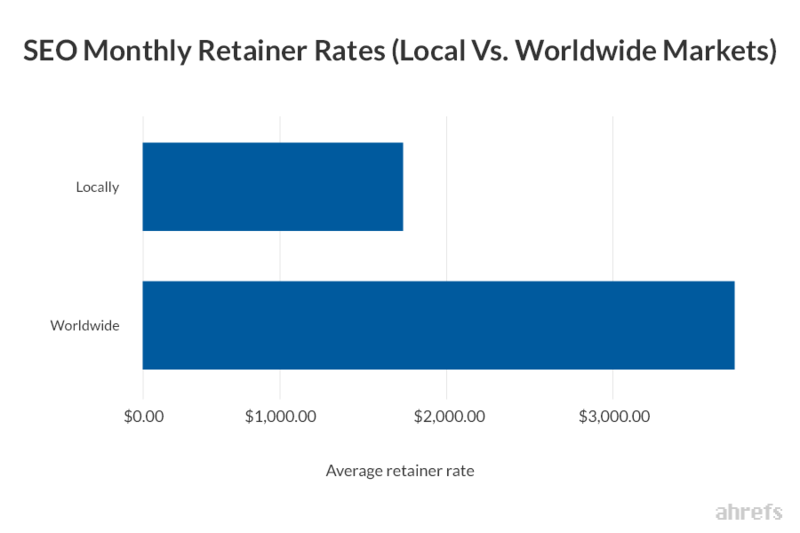 On average, those serving the worldwide market charge 130.74% more than those serving the local market when it comes to monthly retainer pricing. Our findings were similar for hourly and per-project pricing, too—albeit not quite as extreme. 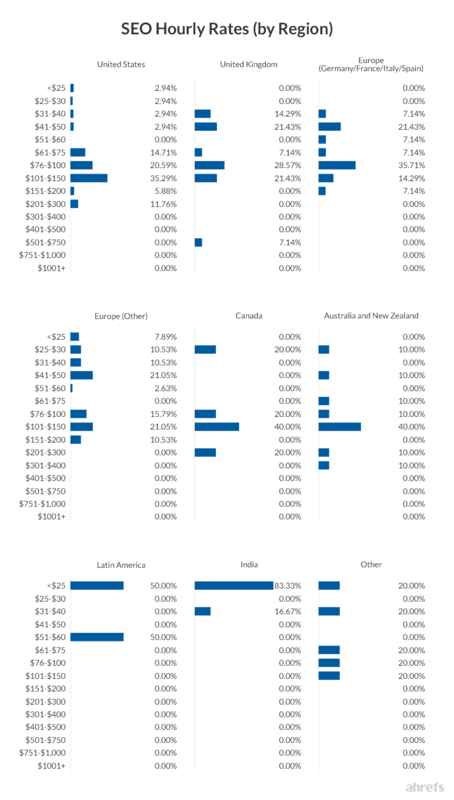 SEOs based in India and Latin America charge significantly less than those based elsewhere. 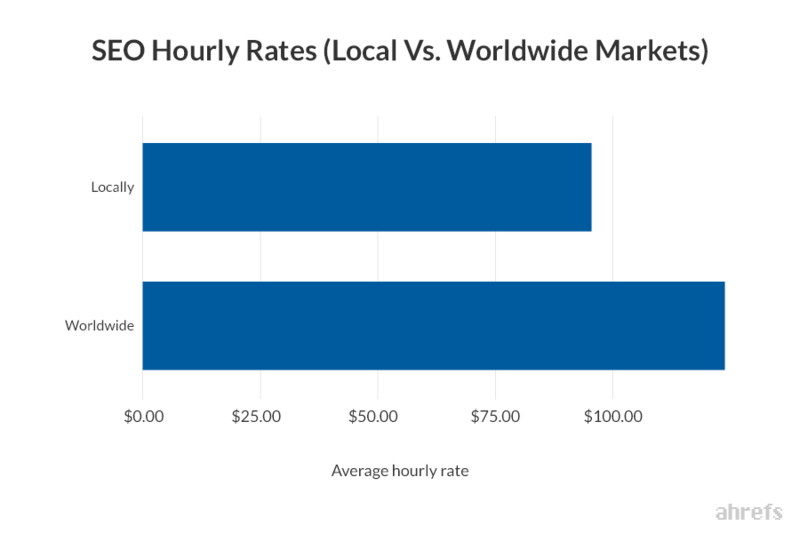 100% of SEOs based in Latin America and India charge $60/hour or less, substantially less than the $108.33 global average hourly rate. It’s a similar story when it comes to monthly retainers and per-project pricing too. 36.78% of respondents price some or all of their work by the hour. 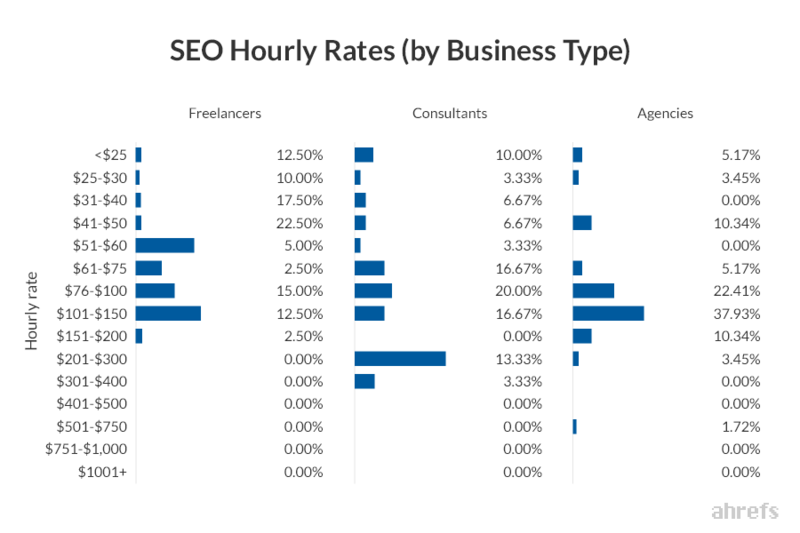 We found that $100-$150 per hour is the most popular hourly rate for SEOs, with 25% of respondents charging this rate. 50% of respondents charge between $75 and $200 per hour. 88.28% charge $150/hour or less, and only 6.25% command an hourly rate of $201+. It’s clear that there is one outlier here: India. 83.33% of India-based SEOs reported an hourly rate of $25 or less. The remaining 16.67% were in the $41–50 range. Looking at US data in isolation, 61.76% charge $75–200/hour—that’s almost two thirds! 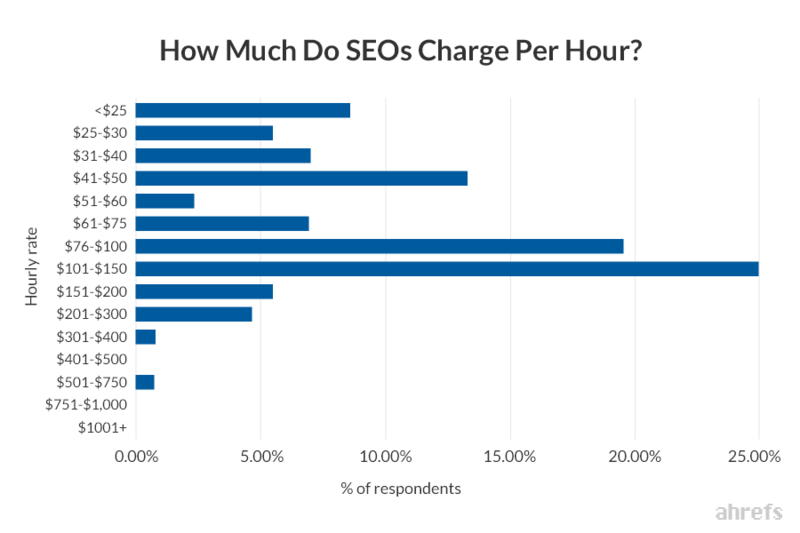 Do SEO Agencies Charge More Per Hour Than Freelancers? 53.45% of SEO agencies command $100+/hour, compared to only 33.33% of consultants and 15% of freelancers. The most common hourly rate for SEO agencies is $100-$150/hour. 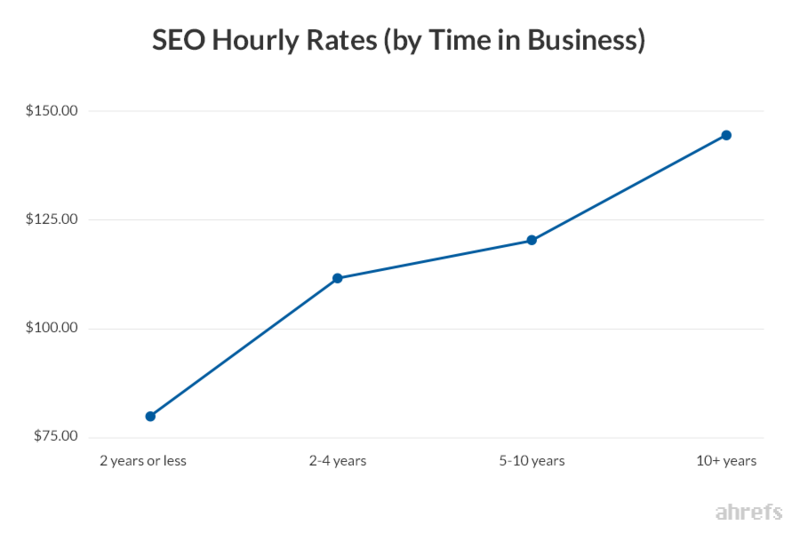 For SEO consultants it’s $75-$100/hour, and for freelancers, it’s $41–50/hour. By these stats, the hourly rate charged by SEO agencies is almost double that of SEO freelancers. Do More Experienced SEOs Earn A Lot More Per Hour? $79.37 is the average hourly rate for SEOs who have been in business for two years or less. This jumps to $110.69 for those who’ve been in business for 2–4 years, $118.85 for 5–10 years, and $142.50 for 10+ years. So, it seems that experience and track record play a vital role when it comes to hourly earnings. Do Those Offering Services Worldwide Charge More Per Hour Than Those Serving Local Markets? Those offering their services locally earn $96.44/hour, on average, whereas those serving the worldwide market earn $118.80/hour. That’s a difference of 23.17%. 74.71% of respondents charge a monthly retainer for some or all of their work. 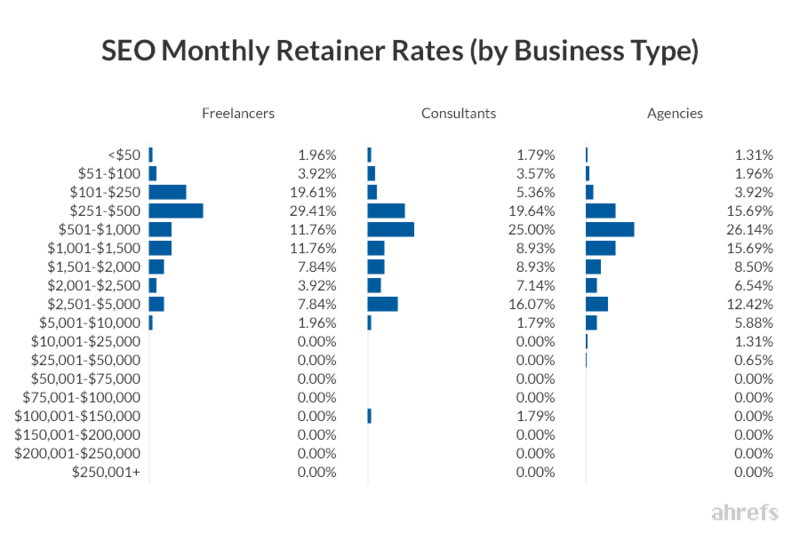 We found that $501-$1,000 per month is the most popular monthly retainer rate for SEOs, with 23.08% of respondents charging this rate. 45% of respondents charge between $501 and $2,000 per month. 75.77% charge $2,000/month or less, meaning that only 24.23% command retainers of $2,001+. Once again, India is a clear outlier here. 91.3% of India-based SEOs charge $1,000 or less per month. The remaining 8.7% charge between $2,001 and $5,000. Looking at US data in isolation, 66.25% charge at least $1,001 per month—some command as much as $25,001-$50,000 per month! Do SEO Agencies Charge More Per Month Than Freelancers? 50.98% of SEO agencies command $1,001+/month, compared to only 44.64% of consultants and 33.33% of freelancers. The most common monthly retainer range for SEO agencies and consultants is $500-$1,000/month. By these stats, the monthly retainer range charged by SEO agencies is more than double that of SEO freelancers. Do More Experienced SEOs Charge A Lot More Per Month? $1,266.31 is the average retainer rate for SEOs who have been in business for two years or less. This jumps to $2,563.20 for those who’ve been in business for 2+ years—almost double that of those who’ve been in business two years or less. While there are appears to be a steep climb in the first few years of business, things seem to level out after 2–4 years. According to the data, those who’ve been in business 10+ years charge roughly the same as those who’ve been in business for just 2–4. Do Those Offering Services Worldwide Charge More Per Month Than Those Serving Local Markets? Those offering their services locally charge $1,566.09/month, on average, whereas those serving the worldwide market earn $3,613.61/month. That’s a significant difference of 130.74%. 43.39% of respondents charge a per-project fee for some or all of their work. We found that $501-$1,000 is the most popular per-project fee, with 25.17% of respondents charging this rate. 52.32% of respondents charge $1,001 or more. 69.54% charge $2,000 or less, meaning that only 30.46% command per-project fees of $2,001+. India and Latin America are the outliers here. 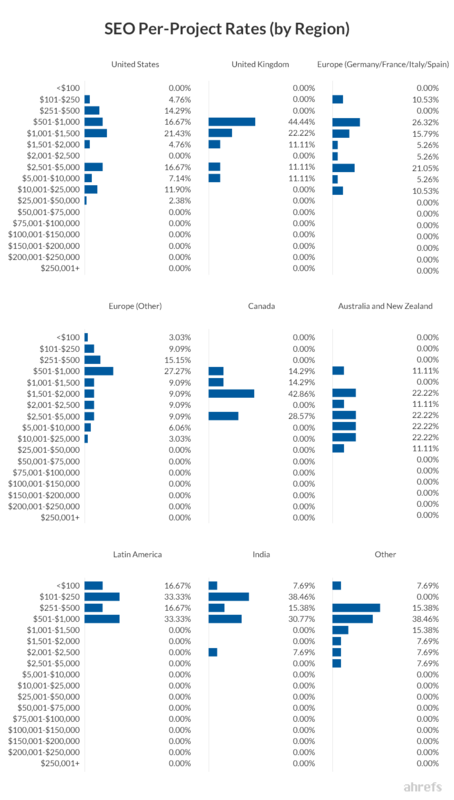 100% of SEOs based in Latin America charge $1,000 or less. Same goes for 92.31% of India-based SEOs—the remaining 7.69% charge between $2,001 and $2,500. Looking at US data in isolation, 64.29% charge at least $1,001. And 11.9% charge $10,001-$25,000 per project! 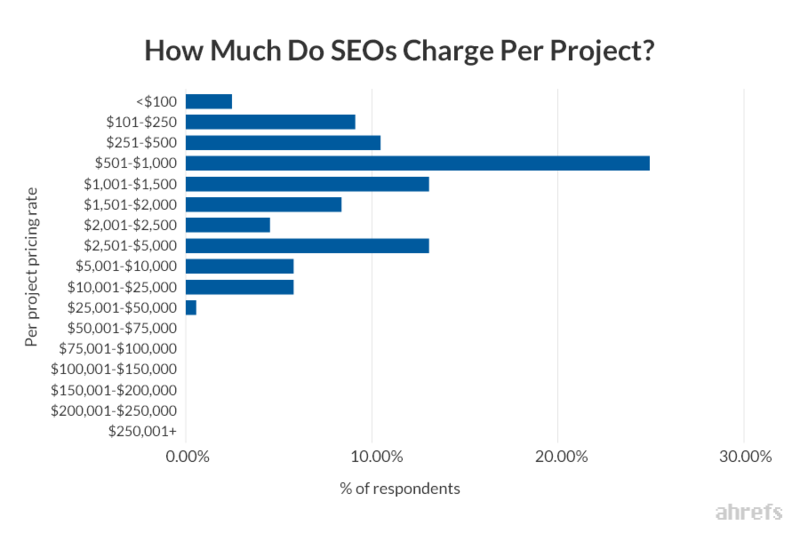 Do SEO Agencies Charge More Per Project Than Freelancers? 64.71% of SEO agencies command $1,001+ per project, compared to only 47.22% of consultants and 38.3% of freelancers. 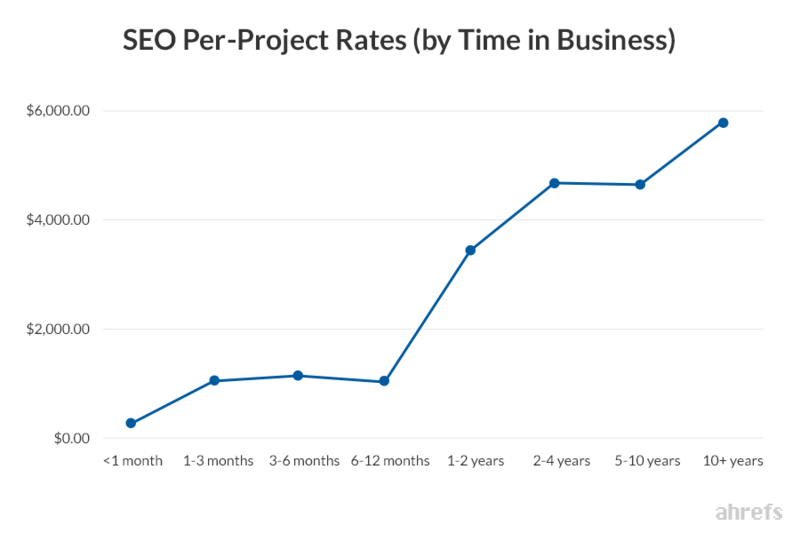 The most common per-project fee for SEO agencies, consultants, and freelancers is $500-$1,000. 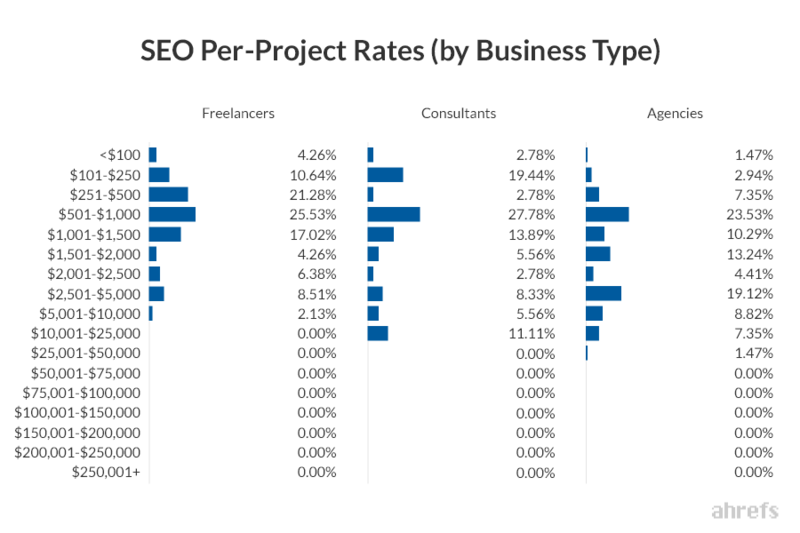 By these stats, the per-project fee charged by SEO agencies is more than triple that of an SEO freelancer, on average. Do More Experienced SEOs Charge A Lot More Per Project? $1,234.60 is the average per project fee charged by those who’ve been in business for two years or less. This jumps to $4,629.59 for those who’ve been in business for 2+ years—almost 4X as much as those who’ve been in business for two years or less. Once again, while there are appears to be a steep climb in the first few years of business, things seem to level out after 2–4 years. According to the data, those who’ve been in business 10+ years charge roughly the same as those who’ve been in business for just 2–4. 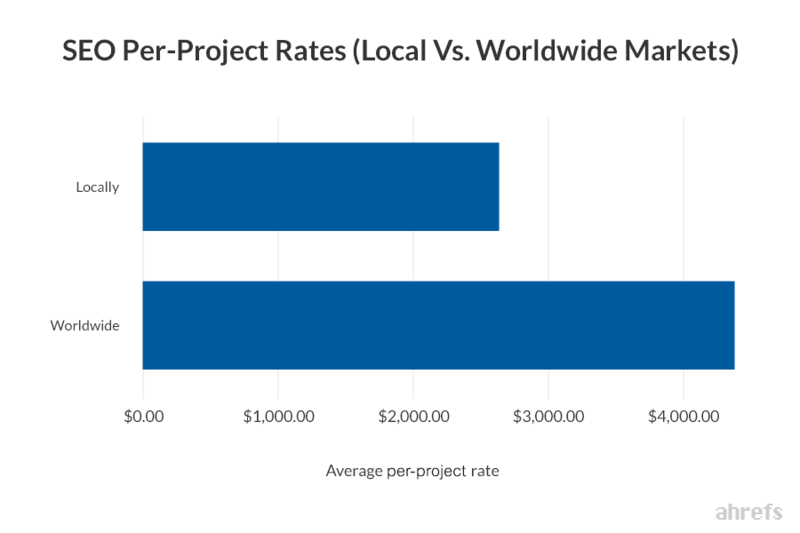 Do Those Offering Services Worldwide Charge More Per Project Than Those Serving Local Markets? Those offering their services locally charge $2,755.88 per project, on average, whereas those serving the worldwide market charge $4,478.50. That’s a significant difference of 62.5%. Do you want even more insights about SEO industry pricing? Or perhaps just the ability to filter the data down to your own country or a specific set of circumstances? You’re in luck—I created a simple “data explorer” in Google Sheets. Access it here. Here’s a quick demonstration video to show how it works.